We bumped and jumped and jolted. The bike sprang to the side, slithered the other direction, and came to a temporary stop. I felt seriously out of practice- not only had I not been on a bike for months, but this rocky terrain was a distant memory of a few weekends in my undergraduate degree when some friends and I thought we’d test to see if we enjoyed mountain biking. (The answer had been yes, but it was too much work to get out to a suitable location to make it a regular occurrence). Here I was, almost half way around the world, trying to remember the little bits of information I had learned on that brief encounter. Keep your bodyweight low. Don’t go too slow. I darted over rocks, branches and fermenting pomelo fruit, dodged chickens and laughed with glee. This is great. 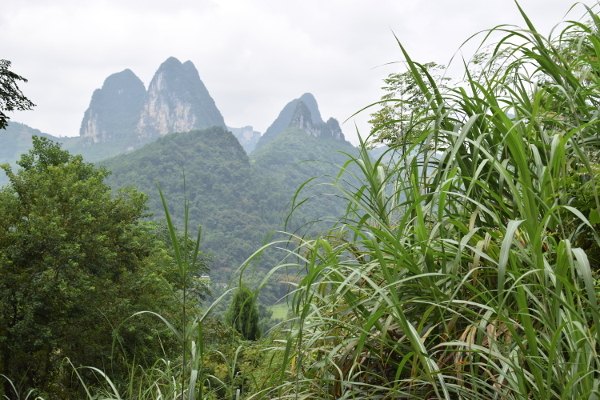 We were in the southern Guangxi province, visiting the famous Yangshuo area, well known for its Karst Mountains, green fields and shimmering rivers. And it’s breath-taking. It helps that I was on a bike, of course, and that in my excitement I didn’t even try to conserve energy for the afternoon ride. But most of my breathlessness was a result of the scenery- the mountains were illuminated in sunshine, which form dividing lines between fields, reservoirs and towns, and provide obstacles to cycle around. We were on a tour, something we had not done since Mongolia. 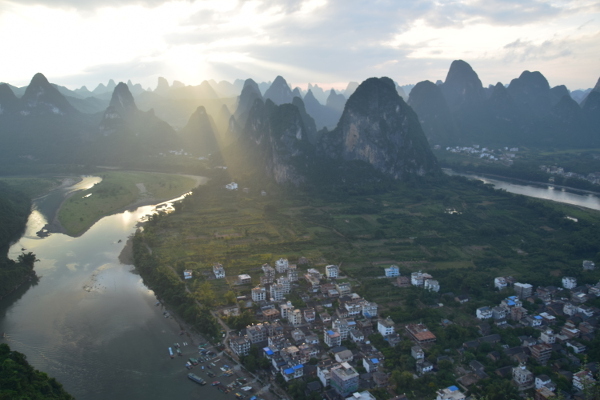 Our tour-guide Sherwin moved to Xingping several years ago to help work in a hostel and learned so much that he opened his own business with some friends. 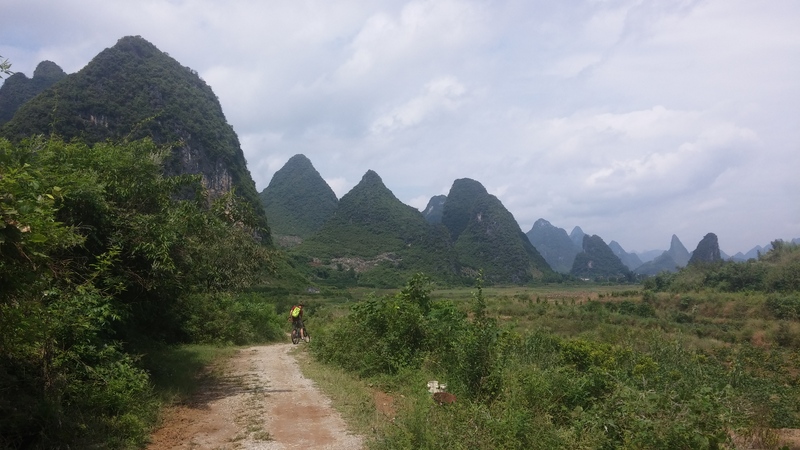 The company, called Mountain Dog, offer mountain biking, bike hire, hiking and are just steps away from getting their climbing license so that they can offer that, too. Not to mention that the café staff whips ups fast snacks and breakfast for when you get peckish just planning your adventures. Sherwin has plenty of experience on these bumpy roads, paths and off-road tracks through the fields; he does this nearly every day, trying different routes to try and make new, interesting, round trip journeys from the office. And with that we come to the main reason we hired a guide: there are several roads around, but we were not confident that we wanted to just veer off on different paths without any way of knowing where they go. And before you ask, no, there are no maps. This is China, remember. Sherwin shows us towns and reservoirs, explains the use of different pools of water in town centres and helps us have a conversation with some locals. He shows us a cemetery and the locals digging a new grave, explains some of the local customs surrounding a death. Best of all, he is exceedingly patient when we can’t keep up, when we are playing with Luke’s new GoPro, or when we get distracted, taking pictures of ducks. We had a fantastic day, saw some wonderful countryside and got a really nice work out. If you are ever in the area we recommend going ‘round to chat to Sherwin and his colleagues- even if you don’t feel you need a guide they can point out some great routes, suggest walks and give you an idea of the conditions of paths and roads. You can find the café on the old street of Xingping town or email them at sherwin922@163.com .